You are here: Home / Top Story / Road closures "frustrating"
Motorists annoyed with lengthy detours caused by floods should know they&apos;re not alone. 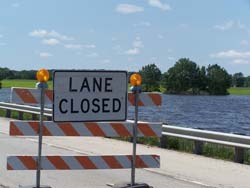 DOT Secretary Frank Busalacchi says he&apos;s not happy about having to close roads throughout southern and central Wisconsin, but the rising waters have left them with little choice. He says the closures have been needed to ensure the safety of the public. Many motorists have been forced to take lengthy detours, especially those trying to travel on the Interstate system. Busalacchi says it&apos;s hard to plan for such widespread flooding. He says there&apos;s been such an unusual amount of water in the state, there&apos;s just no good way to prepare for it. When it comes to planning detours around closed Interstate routes, such as I-94 near Johnson Creek and I-39/90 near Portage, it&apos;s hard to find alternatives. Busalacchi says it really makes people appreciate how vital the Interstate system is to the state. Busalacchi says the DOT is working to help ease the detour problems of many motorists.